7th Street, Key Colony Beach. handle up to a 50 ft. boat. LASTLY we remodeled the entire property in Dec 2017. We have one of the best patios on the Island. Dock your boat right out our back door. Do it all or just relax! Experience counts! We have been renting our properties on Key Colony for 26 years. This our 26rd year renting properties in Key Colony Beach. Deal directly with the owners, no middleman. We have three properties and an impeccable reputation in KCB. Our Grand Slam canal front has one of the best set ups for families that bring their boat. Our rear yard faces the East so you have early morning sun and afternoon shade.We have a bait freezer and dockside electric. Our back patio is perfect for relaxing on KCB's most private canal. Some families have rented all three of our properties for huge family reunions. We can sleep 4 at this property and up to 12 at our other two properties. 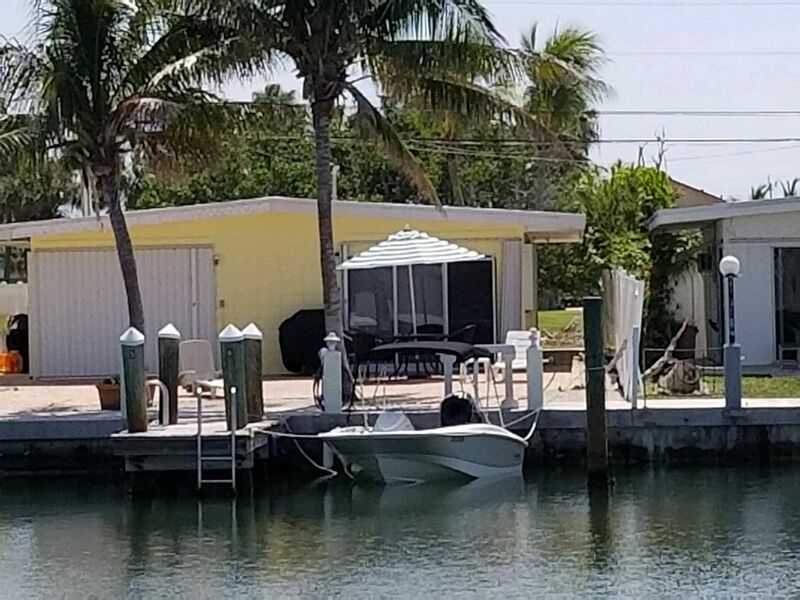 Our canal front duplex has two bedroooms, two full bathrooms, sleeps 4, central air, fully equipped kitchen, dishwasher washer/dryer, deepwater dockage on the widest canal in Key Colony Beach. Our canal faces the East, so you have morning sun and afternoon shade. Our backyard patio is one of the nicest on the canal. We have a gas grill, fish cleaning table, bait freezer, fresh water and electric dockside. All linens provided. No smoking - no pets Experience counts and we have been renting our properties in Key Colony Beach since 1992. The owner, Steve was responsive before and during our stay. The home had everything we needed and the kitchen was well equipped. It was very clean and everything was renovated beautifully. The location was within walking distance of restaurants, the Cabana Club and other activities. The patio area and dock well maintained and we spent many mornings and evenings outside. Friendly neighbors. Wish we were there now. Very nice comunity and an exceptionaly clean duplex to stay in. We enjoyed our stay. The house was perfect for our stay in Marathon. We were so happy to be able to cook and grill and sit out on the dock! We will definitely return! The location is beautiful and the owner is so easy to work with and very responsive to every need and detail. Just like home. A very clean and organized rental. The kitchen is loaded with extras you may need. This was our first trip to the Keys since both of us was kids. We searched many places and chose this one for a 5 day stay. It is loaded with everything needed to feel like home. Very clean and organized. Kitchen has everything needed to cook full meals or use the little toaster oven on the counter for the small stuff. The A/C gets very cold if needed. The bathrooms are excellent condition, as good or better than any hotel I've stayed at. The canal and dock was perfect for our boat, easy to get in and out. Five minutes to the main channel at the posted 5 mph. Has a nice fish cleaning station and water hose available. Sunrise is beautiful sitting on the back patio, a cup of coffee, as the wind blow's through the coconut trees. Great place and stay. The accommodations were better than expected. Clean and “everything needed” kitchen provided some excellent seafood dinners and the Weber provided great burgers. The dock was perfect for our boat along with a washdown and fish cleaning station. We’ll definitely be back next Spring for the Mahi run... Can’t wait!!! Thanks for taking the time to write such a positive review. We pride ourselves on making all 3 of our properties the best in Key Colony Beach. We are always happy to hear that our guests are planning a return trip. We have been renting our properties on the Island for 26 years and and feel that we offer great value and experience to our guests.